If your workplace uses any sort of chemicals, there should be an eyewash station close by. Fortunately, they are not used very often but that can also make them blend into the background. Most wash stations are used so little that they begin to collect dust or maybe even used to store random stuff. 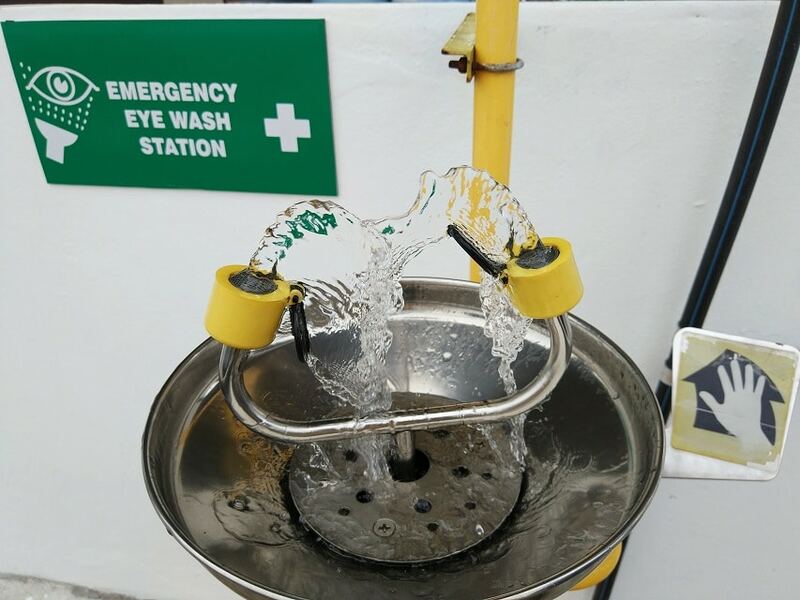 Would you know where and how to use an eye wash station if you needed to? First and foremost, a wash station is not where you store anything. In fact, they need to be readily accessible. This means nothing blocking access to them and nothing covering them. They also need to be cleaned and maintained on a regular schedule. So, with that out of the way… would you know what to do if you splashed some corrosive chemical in your eye? Here are some quick instructions to help you out. First, get someone to call for emergency help. Then get help walking to the station. Keep your eyes closed and head down. Once at the wash station, start it. Sometimes this is a hand lever and sometimes it’s a foot lever. Remove any contact lenses immediately. Keep eyes wide open with the water pouring over them. Do not rub your eyes. Do not try and remove any foreign objects from your eyes. Move your eyes around and get all surfaces, under, over and beside. Even if you think you only had contact with one eye, it’s a good idea to clean both. Do this until the emergency crew has shown up; or, for at least 15 minutes and then get someone to take you to the hospital. Most people have never really checked out a wash station. However; when you are blinded and in pain, is probably not the best time to try and figure out what you’re doing. So, walk over and take a look. Try it out. Hopefully you’ll never have to use it, but it’s good to be prepared.